Come KiCk OuT the jAmS! I will be debuting some bass drum artwork this Saturday, June 27th at The Boro in Murfreesboro, TN for The Lake. So come peep you eyes at my work and listen to The Lake...along with Daniel Pujol and other talented musicians! Show starts at 9pm...check out www.myspace.com/thelaketheband for more information about the show! See you there! Need some art to jazz up those boring walls? Check out the fine art section to see NEW paintings available for purchase. If you are local, stop by Serendipity in the 12th South District (2301 12th Ave South, Nashville, TN 37204) and see them in the flesh! They are available for purchase in store or online. Shoot me an email or give me a ring (+1 931.409.3665) to set up a purchase plan with online orders. If you are interested in a custom job, lets have a chat! THANK YOU to everyone who came out to the show on Thursday! It was all a great success because of your support!! Reminder! 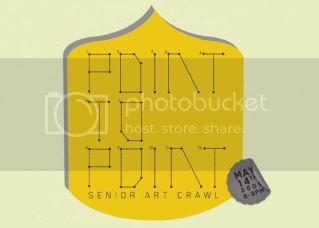 "Point to Point" The Senior Art Crawl is happening tomorrow evening from 6-9 pm! The design students will be in the Belmont Mansion. There will be food, drinks, and music too! So come on out and support your local budding artistic talent!!! Hope to see you there! The countdown is on! Graduation and my portfolio show is fast approaching! So, grab some pencil & paper and jot down the following! Mark your Calendars! 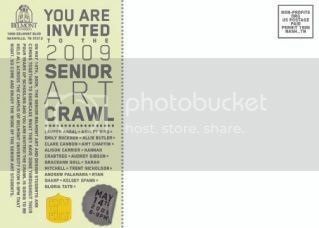 The Belmont Senior Portfolio Show is set for May 14th, 2009. It will be from 6-9pm in the Belmont Mansion. The senior art education and fine art majors will be having an art crawl across campus in conjunction with our portfolio presentation. So come on out and feast your eyes on Belmont's young creative talent! The Belmont Student Juried Exhibition is now up! There will be an awards reception April 2nd, 2009 from 4-7pm. It will be up for the next few weeks, so stop by the Leu Center for the Visual Arts and check it out! Good news! I took 2nd Place in the 2-D Category of the Student Juried Exhibition! It was my "Rhythm & Soul" piece. You can see it in the Fine Art section of the site or in the lobby of the Leu!